Joyful rainbow-bathed seals armed with glowing care-stare attacks. The pink beams of warm light emanating from their eyes seem to disarm even the most sea-doggiest of mice, lulling them into a relaxed and contented state. We don't actually know how the eye-beams work, and have decided to not let Science get in the way of this underwater miracle! Rainbows under the sea? Believe it! NOTE: Do not touch the glowing eyes of The Seal. Do not look directly into the glowing eyes of The Seal. The Seal Skin can be used on the Rune Shark Trap. The trap's stats (power, power bonus, attraction bonus, etc.) are not changed. 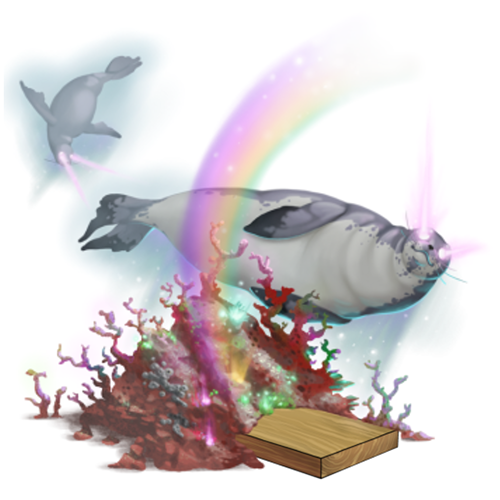 The Seal Skin can be purchased at the Sunken City Trapsmith for 490,000 gold, 180 Sand Dollars, 75 Barnacles, 75 Mouse Scales, and 75 Damaged Coral Fragments. It can be refunded at the same location for 88,000 gold. The Seal Skin can be traded on the Marketplace or through Give To Friends. 2 July 2014: The Seal Skin was released with the introduction of the Sunken City. This page was last edited on 9 December 2017, at 14:51.